“I will let everyone know right now that I will not only post news reports but also my political opinions on my blog on the day before, and on the “cooling-off” day itself,” blogger and activist, Mr Seelan Palay says on his blog here. “I will post images and logos of the political parties and figures that I support and will blog about who I voted for and why,” he adds. Mr Seelan, 25, has been involved in public protests for various causes since 2006, including the abolition of the death penalty and the Internal Security Act, demonstrating outside the Ministry of Manpower office in support of Burmese nationals, and conducting a one-man, 5-day hunger-strike at the Malaysian embassy calling for the release of the Hindraf detainees in that country. 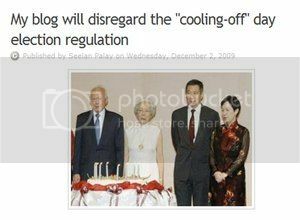 He feels that the recommended “cooling-off” day or period made by Prime Minister Lee Hsien Loong does not address the “fundamental issues” of what Mr Seelan calls “unjust laws and regulations”. PM Lee said he hoped that netizens will observe the “spirit” of the proposal. Citing the exclusion of the mainstream media or “news reports” from the proposed rule, Mr Seelan feels this is neither justified nor fair. “The mainstream media is controlled by the [PAP government].” He says he might have considered accepting the proposal if Singapore had a plurality of independent media and news outlets. Since this is not the case, bloggers and netizens should not be curbed in expressing their views online during the elections, he says.